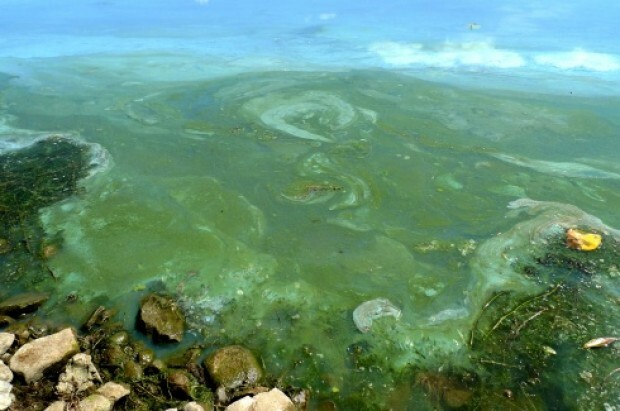 The blue-green algae bloom on Skaneateles Lake New York State contains nearly nine times the amount of toxic chemicals that the state considers to be "high toxins." The state Department of Environmental Conservation notified public officials today that water samples taken Saturday near the pier and the stairs to the beach contain high levels of a liver toxic produced by the blue-green algae. The state considers 20 micrograms per liter of the toxin mycrosystin to be "high toxins" level. The sample taken from the beach stairs in Skaneateles Lake had nearly nine times that level -- 171.5 micrograms per liter. The pier reading was 126, more than six times the "high toxins" threshold, the DEC said. Ingesting large amounts of the microcystins can kill pets and cause liver damage in humans. The city of Syracuse draws its drinking water from Skaneateles Lake. A city spokesman on Friday said there was no threat to the drinking water "at this time" because the algae blooms were near the shore and the intake pipes are out toward the middle of the lake. In a statement, Syracuse Mayor Stephanie Miner said: "At this time, the blue-green algae blooms on Skaneateles Lake pose no threat to city water users."